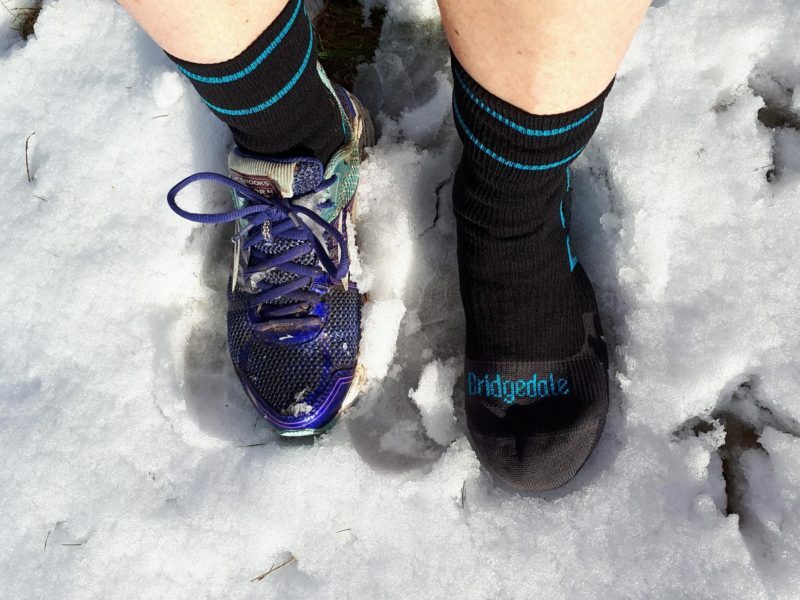 I’ve worn waterproof socks regularly for winter running for the last few years, for comfort with unlined footwear and to stop chilblains from being in cold and wet footwear. More recently I’ve also started using them for walking in lightweight boots and trail shoes when I know I’ll end up with wet feet but don’t want the added weight of my waterproof boots. 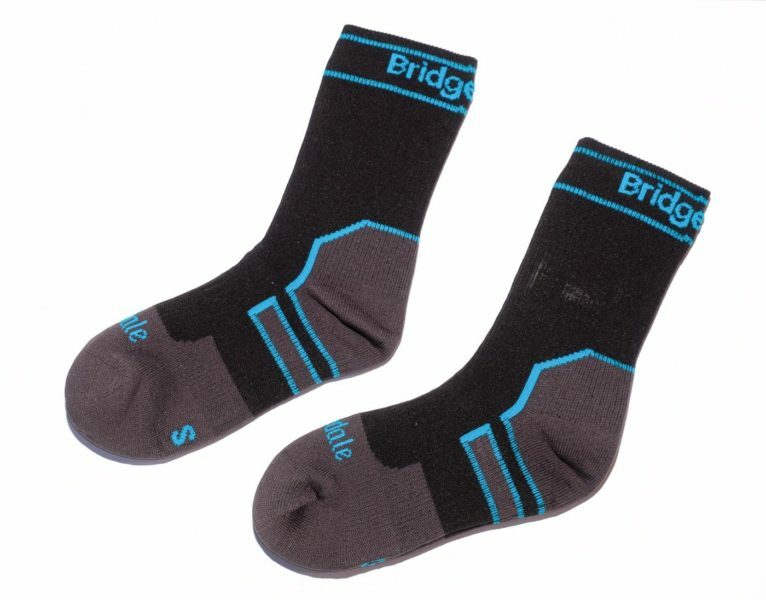 Despite keeping toenails short and taking care to rinse and dry the socks properly, I’ve not had a pair that have lasted more than a year before the waterproofing wears out and it’s back to cold, wet feet – so I was keen to put this boot length, mid-weight sock from Bridgedale to the test. This is a three layer sock with a nylon and elastane outer, HydroTech breathable waterproof membrane, and an inner layer combining 54% merino wool with polyester, nylon and elastane. The effect is something that feels a bit more like a regular sock with a less rubbery feel than previous ones I’ve tried. There are terry loops at the footbed, ankle and toe which make it softer and the seams which run along the length of the top and bottom of the sock and across the toe are smaller although not completely flat. There is more elastic in the arch to support the foot. The elasticated cuff is not overly tight; snug, but with enough room to tuck trousers in. The boot length option comes half way up my shins. I found them comfortable both for walking and running and they definitely kept my feet warm running in snow and slush and walking through lower level bogs in wet shoes. No rubbing, blisters or hot spots despite some worries about the potential for the long seam to rub. They do work – my feet were kept dry and relatively warm. When you step in a deep puddle or bog you still feel the cold and wet in your shoe but taking my footwear off on these occasions has shown the inner sock is actually still dry. The cold feeling wears off pretty quickly and once in dry conditions the socks soon dry to a good comfort level in mesh shoes or trainers. Overall my feet have been considerable warmer than with ordinary socks. My feet are usually damp and sweaty after a normal low level winter walk or shorter run but I haven’t found the build up of sweat uncomfortable, certainly not the “plastic bag” effect that people used to talk about, so they do breath but depending on the conditions you’re still likely to end up with slightly damp feet from sweat after prolonged wears. For multi-day hikes it might be worth trying them with thin liner socks which can absorb most of the sweat and can be dried quicker or replaced for the next day. Although they can be machine washed at up to 40 degrees, left to drip dry or put on a low tumble dry, I tend to rinse them immediately after use and then dry them in the sun or somewhere warm. They should be turned inside out before washing. Despite merino wool in the inner layer, they still smell pretty bad when wet and rinsing should also get rid of any grit, bits of heather etc that could pierce the membrane. They should not be wrung out and gentle squeezing doesn’t seem to get much water out so they take a long time to dry and would be a consideration on multi-day trips if you don’t like donning damp socks in the morning. So far they’ve not shown any obvious signs of wear and tear except for the terry loops quickly becoming compressed at the heel. I liked the boot length as it easily sits above the cuffs of high boots but the Stormsock also comes in ankle and knee lengths as well as light and heavyweight versions. Overall this is an improvement over waterproof socks of a few years ago. They are a good option for boggy or wet hill days when you prefer the comfort of non-waterproof footwear, or for extra protection in the worst conditions, or even something dry and warm to put on your cold feet on multi-day camps.